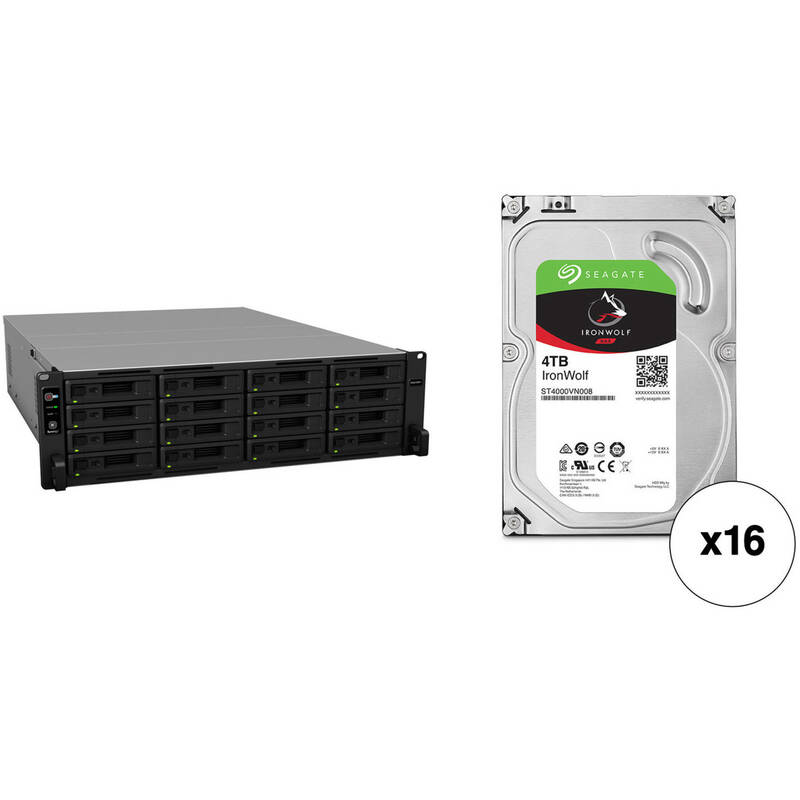 This B&H Kit combines the Synology RackStation RS2818RP+ 16-Bay NAS Server with sixteen Seagate 4TB IronWolf 5900 rpm SATA III 3.5" Internal NAS HDDs for a total storage capacity of 64TB. Well-suited for small- and medium-sized businesses, the RackStation RS2818RP+ 16-Bay NAS Server from Synology delivers flexibility in terms of its expandable storage capacity, upgradeable memory, and optional high-speed NIC support. It can serve as a backup target for distributed businesses, a centralized file server, or a backup target for employee workstations in growing businesses. This unit has a 3 RU form factor and 16 drive bays, each of which natively supports 3.5" SATA hard drives, as well as 2.5" SATA hard drives and SSDs. Should users need to expand the overall capacity of their RS2818RP+, the optional RX1217/RX1217RP expansion units offer an additional 12 drive bays, and one of these units is supported via an integrated expansion port. Additionally, should power to the NAS be interrupted, the RS2818RP+ comes equipped with a 500W redundant power supply. The RackStation RS2818RP+ is powered by a 2.1 GHz Intel Atom C3538 Quad-Core processor, which will allow you to run multiple functions simultaneously. The built-in 4GB of DDR4 RAM will allow quick access to frequently used files and programs and may also be upgraded to a total of 64GB by installing four 16GB modules into the available memory slots. Also featured are two USB 3.0 Type-A ports, which allow it to be connected to your Windows or Mac system. Network connectivity is achieved via the four Gigabit Ethernet ports with failover support, which helps to provide redundancy in the case that a LAN connection malfunction occurs on one port. In addition, link aggregation, powered by four LAN ports, helps to increase connection speeds beyond the limits of a single network port or cable. If you're looking to expand this NAS with a M.2 SSD for caching or 10 Gigabit Ethernet, there is a PCIe Gen 3.0 x8 slot that runs at x4. The RackStation RS2818RP+ runs on the DiskStation Manager (DSM) operating system, which helps simplify managing your NAS, as well as accessing and sharing data. A variety of RAID modes are supported, which help provide users with data redundancy, speed, or a combination of both. Supported RAID modes include RAID 0, 1, 5, 6, 10, Basic, and Synology Hybrid RAID. For those who do not require a RAID, JBOD is also available, allowing each drive bay to be individually utilized. Synology has engineered the RackStation RS2818RP+ to be energy efficient. Not only does it offer three 80 x 80mm fans to help keep the system running cool, the server supports numerous scheduled power on / off cycles and hard drive hibernation to further minimize power consumption and operation expenses. The RackStation RS2818RP+ operates on 100-240 VAC at 50/60 Hz and includes an accessory pack and two AC power cords. Protection is provided by a limited 3-year hardware warranty. The RS2818RP+ provides a large, scalable storage capacity with affordable total cost of ownership. The 3 RU chassis design accommodates up to 16 drives and the storage capacity can be further scaled up when connected to one Synology RX1217 or RX1217RP Expansion Unit, providing a total drive count of 28 without disrupting host services. File- or Folder-Level Data Restoration Helps make data recovery user-friendly and flexible. The RS2818RP+ integrates various backup applications to help safeguard your important data on devices with an intuitive user interface and durable storage technologies. An agentless backup solution helps protect data from Windows and Linux servers through SMB and Rsync to minimize deployment and management costs. Help safeguard your system with Cloud Station Backup and back up data stored on macOS to your Synology NAS with Time Machine. Powered by Synology DiskStation Manager (DSM), Synology NAS offers advanced security measures to help protect against sudden data loss and potential security holes. Synology's operating system has an intuitive user interface and powerful capabilities. Backup and synchronize data between your public cloud accounts and your NAS. Helps ensure smooth transitions between clustered servers in the event of server failures. Helps provide schedulable and instantaneous data protection for shared folders and virtual machines on iSCSI LUNs in the event of disaster. Box Dimensions (LxWxH) 34.8 x 24.4 x 11.8"